Do you think that “size does matter!” proverb applies to books also? Well, I believe that it does matter it is not the main attribute. If you have a gripping story to tell and more importantly you know how to tell it, the reader will surely enjoy! When short stories are put together in a collection, the package becomes more interesting, considering the stories are interesting. Here are a few short story collections we’ve shared our views about. 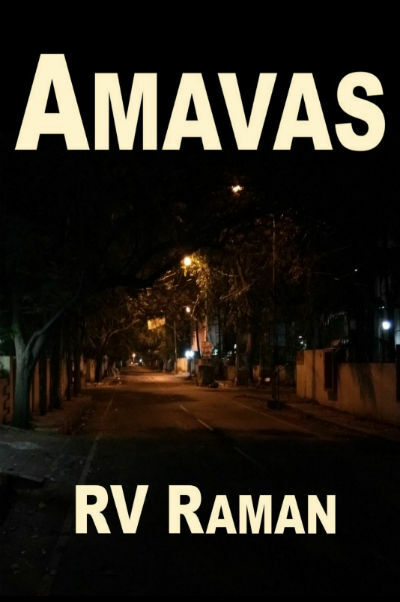 Adding to the list today I am going to share my unbiased views and reviews for Amavas, a short story collection by R. V. Raman. This short EBook contains two interesting stories. Let us take a look at the cover page of the book before we talk about its content. As you can see the cover page is black and white and minimalistic. Actually, it reflects the title “Amavas” (the – no moon – night), so you can consider it relevant to the book title and content. I could have written off the cover page, but the reflection of a street with street lamps makes is interesting. However, it fails to create a very strong impression. Cover plays a very important role in influencing people to make purchase decisions. And, needless to say, that the cover page does it moderately. It would be challenging to talks about the stories and avoid all the spoilers. When reviewing short stories, it always remains a challenge. As, when taking even a bird’s eye view to the plot, we need to reveal at least some part of it, and the short stories themselves are “short”. Anyway, let us try to have a spoiler-free review. But, please read ahead with the consent that some of the spoilers might be there :). This story belongs to a couple. The male protagonist was a commando and is retired now. His wife also has served in Army. Actually, they met at the border of India-Bangladesh! They are blessed with a beautiful girl. So, they are living a happy family life. Since last few months, the city was under a threat. Actually, last few Amavas nights proved to be fatal for one of the citizens. There happened a murder on this specific day (actually night). Today is also the same day, and thus the TV channels are shouting about it. It makes the male protagonist angry. Actually, none of the parents would let such news take over the soft brain(s) of their child, right? Who is the serial killer and why is he doing what he does? And, will this family be affected by these incidents anyway? An author is famous for his writings. One fine day when he and his sister had their mischievous family time, his sister brought his attention to an advertisement. The advertisement was really interesting. It offers experience in jail by paying only Rs. 500! Actually, he thought, staying in a jail for a day will let him experience the feelings of a prisoner. And, it can help him in in future books. He can write the jail scenes and the psyche of various people associated with it, quite authentically. Do you think it is a good idea? What do you think he will experience when he pays a visit to the place mentioned in the advertisement? This is the first work by Mr. R V Raman which any of our team members got a chance to read. Actually, we are curious to read his thrillers also, but, maybe sometime in the future. Both the stories are very small, actually, the total book length is 33 pages including the cover and title pages. And there are pages devoted to information about the other books by the author. So you can understand the length of each of the stories. They are short, as said, but, they are interestingly gripping. It is quite possible that you successfully guess the suspense before reaching to the end of the story (for both of them). But, the crisp writing keeps you hooked throughout. The character names are interesting and more importantly, the characters are developed pretty effectively. None of the characters is any of the stories is weak. Actually, writing a short story is like walking on a tightrope. While you cannot go into much detail and cannot take time in building the setup and at the same time, the reader should not feel that he is thrown into something without proper explanation. R V Raman walks brilliantly on the rope. The author got the period of Amavas quite wrong. Though there are two fortnights in a month, there comes only one Amavas in a month. One fortnight ends with no moon night and the other with the full moon night. So there cannot be 2 Amavas in a month anyway. Also, at the end of the article, I am going to share a few external links, all belongs to author’s official website. The good news is, both the stories are available to read for free (in the form of PDF) while I am writing this :). So, if you are able to read it for free, then the only cost you pay (which is the most important) is your time. And if you love reading thrillers, you will surely consider at the nice use of your time. A pricey (unless you can get it for free as mentioned), short, thrilling EBook. A good choice when you are looking for a half an hour read. Around 7.5 out of 10.